Since David Gartry is an accredited NHS Consultant Ophthalmic Surgeon (appointed in July 1995) he is qualified to deal with more complex problems and regularly treats patients referred from other clinics. David offers a unique combination of experience, expertise, and excellent results. David graduated in 1978 with a first class honours degree in Optometry from Glasgow Caledonian University and completed his pre-registration training at Moorfields Eye Hospital the following year. In 1979 he was awarded the Colebrook and Porter prizes of The British College of Optometrists, the Master’s Prize of The Worshipful Company of Spectaclemakers (SMC) and the J Stephen Dawson Memorial award of The Institute of Optometry. He then read Medicine at University College London where he won several academic awards including first place in the annual national Sir Stewart Duke-Elder prize in Ophthalmology. 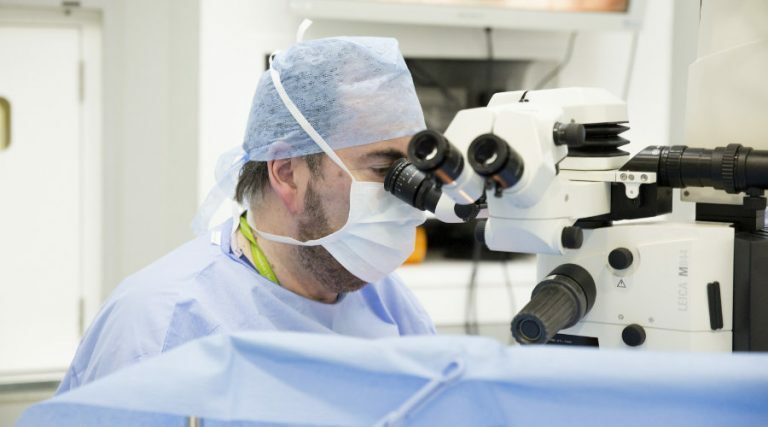 David moved to Moorfields Eye Hospital, London in 1992, and from January 1998 onwards he was responsible for the first LASIK (laser assisted in-situ keratomileusis) research protocols at Moorfields. He has published over 50 scientific papers relating to laser eye surgery, cataract surgery and corneal surgery and has spoken at numerous international meetings presenting scientific papers and keynote lectures. In 1991 he was awarded The Storz Medal and in 1993 The Iris Fund Triennial Award (Shared with Professor Sir Peng Khaw). He has written several book chapters and co-authored 3 textbooks: ‘Excimer Lasers in Ophthalmology – Principles and Practice’ (1997, Martin Dunitz), ‘Cataract Surgery’ (2003, BMA publishing), ‘Corneal Surgery’ (2013, Springer-Verlag). In February 1995 he delivered one of the prestigious discourse lectures to The Royal Institution of Great Britain (a historic scientific society founded in 1799 by Sir Michael Faraday) and following this was made a member of The Royal Institution. David is a past-President of The British Society for Refractive Surgery (BSRS), a member of both the European Society of Cataract and Refractive Surgeons (ESCRS) and the American Society of Cataract and Refractive Surgeons (ASCRS). In 1999 he was made an ‘Honor Award Recipient’ of The American Academy of Ophthalmology (AAO) for his contributions (teaching, publications and presentations) to The AAO. He is an examiner for The Royal College of Ophthalmologists and was instrumental in developing the College’s Certificate in Laser Refractive Surgery. He was appointed Visiting Professor to the Faculty of Visual Sciences, City University, London, in June 2006, Director of Refractive Surgery, Moorfields Eye Hospital in December 2007, and was entered into the 2007 edition of ‘Who’s Who’. As a member of the Corneal, Cataract and Refractive services at Moorfields his specialist interests include corneal grafting, the latest cataract surgical techniques (phakoemulsification / femtosecond laser cataract surgery) – having supervised the cataract training courses at Moorfields – and laser refractive surgery. He has extensive experience of both laser (PRK, PARK, LASIK, LASEK) and non-laser techniques and has carried out over 20,000 LASIK procedures and over 15,000 cataract / refractive lens exchange procedures including over 1000 femtosecond laser procedures to date. David underwent LASIK himself in October 2000 for treatment of his compound myopic astigmatism. David Gartry lives in North London with his wife, (an optometrist) and three sons (a junior doctor, a professional musician and a medical student). With a distinguished career in ophthalmology spanning over 3 decades, David Gartry remains at the forefront of vision correction and eye surgery. He is one of the most experienced eye surgeons in the UK and was the first surgeon in the UK to carry out laser eye surgery. Establishing his own eye clinic on Wimpole Street in 2015 has allowed David to realise his own vision on pushing forward and innovating in this field. Why choose David Gartry as your surgeon? David Gartry has his own accredited National Health Service consultant clinic (appointed in July 1995) where he is qualified to deal with more complex problems and regularly treats patients referred from other clinics. Not only does David Gartry perform your treatment, he is one of the few surgery providers that also carries out your initial consultation and all follow up visits under his unique ‘open door policy’. In 2018, he was voted one of the top UK cataract surgeons by his peers in the Good Doctors Guide. David was the first surgeon in the UK to perform laser eye surgery – in 1989. Honorary Visiting Professor, Faculty of Visual Sciences at City University, London. State-of-the-art technology including the IntraLase and Catalys femtosecond lasers. Over 26,000 laser eye surgeries completed, and is a pioneer at the forefront of laser eye surgery. David has also completed over 15,000 cataract and refractive lens exchange procedures. David and his team pride themselves on being warm, professional and approachable. David provides all patients with his mobile phone number. Full clinical support with highly experienced optometrists, nurses and admin team – many who have been with David Gartry for over ten years. With over 30 years experience in ophthalmology he has the ability to deal with complex treatments that other clinics may not be able to assist with. David is an examiner for the Royal College of Ophthalmologists and helped set up the RCO laser eye surgery exam. David holds The Royal College of Ophthalmologists certificate in refractive laser surgery. 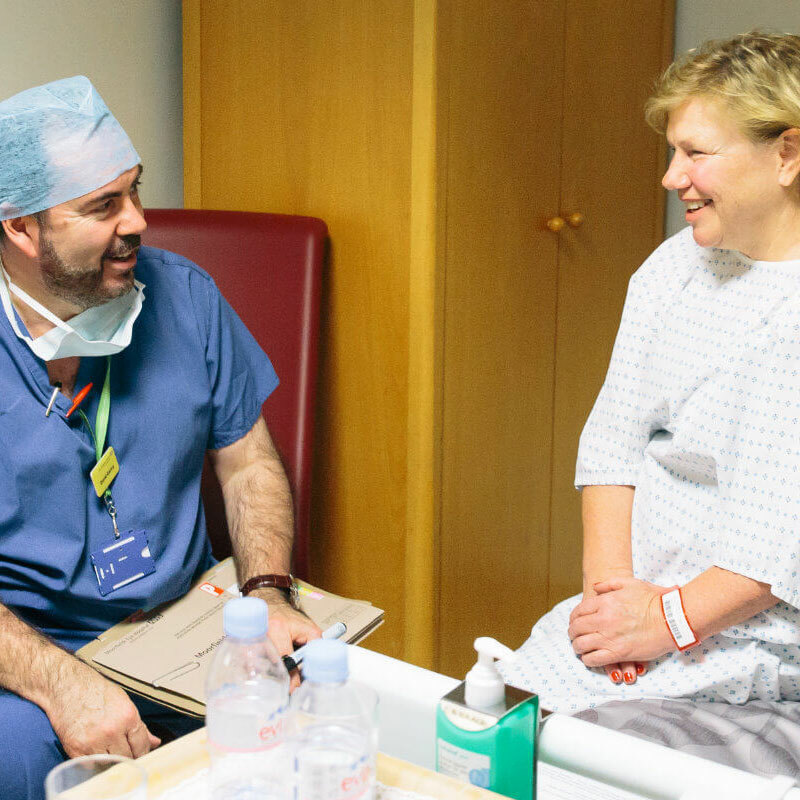 Since David Gartry holds a consultant post at Moorfields Eye Hospital his patients benefit from the security of being treated in a large, well-respected hospital with 24-hour walk in primary care cover. The following principles, or ‘rules of laser eye surgery’, are based on over 32 years of experience and result from listening to patients before and after their treatments on a one to one basis – which David Gartry considers to be very important indeed. There is no substitute for discussing the treatments in detail before, during, and after the surgery with the treating surgeon. These principles or ‘rules’ help in the management of patients’ expectations – especially in relation to close reading vision for those over 40! From the above results it is true to say that almost all patients have at least 90% of their prescription eliminated. This applies even to the high prescriptions. For example, patients with -10 dioptres of myopia would be typically left with -1 dioptre or less. On average, only 3-4% of patients have a retreatment procedure within the first six months to “fine tune” the result. As can be appreciated from the above results, these patients tend to be those who had very high prescriptions initially. Given that it is impossible to promise perfection in every case, and since it is rare for patients to have absolutely zero prescription (even Royal Air Force pilots have tiny prescriptions for which they do not require spectacles of course), it is always better to remain slightly short-sighted if you have been myopic (short-sighted) before – and slightly long-sighted (hypermetropic) if you have been long-sighted in the past. Myopic patients tend to adapt well to small amounts of residual myopia – say, -0.50 dioptres – while long-sighted (+) patients prefer +0.50 dioptres, if not absolutely zero prescription. Patients who are moderately short-sighted prior to the surgery, and could therefore read well unaided without any spectacles (for example when reading in bed), would often find it difficult to adapt to losing this ability. Simply stated, if patients have an excellent result which allows them to see very well indeed for long distance (normal vision – emmetropia) then beyond aged 40 they will certainly find it more difficult to read and from mid-40s onwards would often use simple reading spectacles. In David Gartry’s experience this principle is one of the most difficult to convey to patients prior to their surgery. However the advantage of being able to see well without spectacles – often for the first time in their lives – usually more than outweighs the disadvantage of reduced near vision for patients over 40. They won’t be able to do this once their myopia (short-sight) has been corrected. These, and many other aspects (age, occupation, sports and hobbies and monovision or blended outcomes) are carefully taken into account when deciding on the programming of the laser. The desired outcome is carefully planned during discussions with each patient. Very rarely is the simple spectacle prescription programmed into the laser without modifications. David Gartry has played a key and active role in ophthalmic research and education. He has written three textbooks and published over 50 papers. Graduating in 1978 with a first class honours degree in Optometry from Glasgow Caledonian University, David then went on to complete his pre-registration training at Moorfields Eye Hospital in 1979. He was also awarded the Colebrook and Porter prize from The British College of Optometrists, the Master’s Prize of the Worshipful Company of Spectaclemakers (SMC) and the J Stephen Dawson Memorial award from The Institute of Optometry that same year. He then went on to read Medicine at University College London / University College Hospital qualifying as a doctor in 1984. 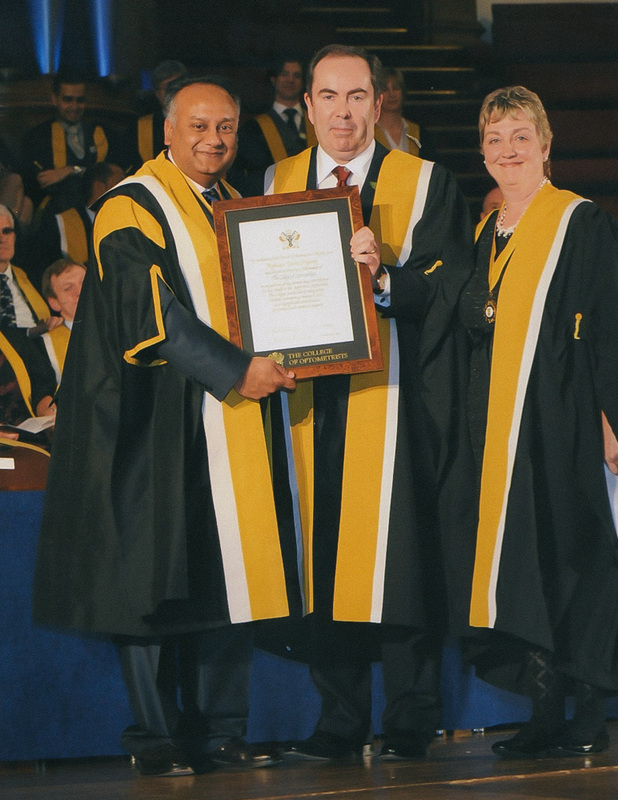 In 1988 David Gartry become a Fellow of the Royal College of Surgeons and The Royal College of Ophthalmologists. 1989 was a groundbreaking year as November saw David Gartry perform the first laser eye surgery procedure in the UK. In addition to many peer-reviewed published works David teaches at City University and was officially appointed Visiting Professor to their department of Vision Sciences in June 2006. The British College of Optometrists. 1999 The American Academy ‘Honor Award Recipient 1999’ for research and teaching contributions to The American Academy of Ophthalmology. 2001 Treacher Collins Prize of the Royal College of Ophthalmologists for cataract surgery innovation. Excimer laser treatment of corneal surface pathology: a laboratory and clinical study. – 18 month follow up. The effect of topical corticosteroids on refractive outcome and corneal haze following photorefractive keratectomy : A prospective, randomised, double-blind trial. uncomplicated by advanced proliferative vitreoretinopathy. D S Gartry, DFP Larkin, AR Hill, LA Ficker, ADMcG Steele. Primary intraocular lymphoma with lymphomatous meningitis. Bilateral cilioretinal artery occlusion in classic migraine. Photochemical effects of lasers in refractive surgery. June 1989 pp 291295. Capelli Editore. Excimer lasers and refractive surgery. “Haze” in photorefractive keratectomy: Its origins and consequences. La cecite due au glaucome primitif a angle ouvert. A new technique for objective measurements of haze. The effect of topical corticosteroids on refractive outcome and corneal haze following photorefractive keratectomy : A prospective, randomised, doubleblind trial. Gartry D S, Muir M G K, Marshall J.
urasache, objektive messungen und funktionelle konsequenzen. Gartry D S, Kerr Muir M G, Marshall J.
Mosby Yearbook of Ophthalmology 1992 C V Mosby, St Louis. Photorefractive keratectomy: implications of corneal wound healing. photorefractive keratectomy : a prospective, randomized, double-blind trial. The effect of topical corticosteroids on refraction and corneal haze following excimer laser treatment of myopia : an update. A prospective, randomised, double-blind study. Inleiding in de fotorefractieve keratectomy. Mosby Yearbook of Ophthalmology 1993; CV Mosby, St Louis. Treatment of myopia with the excimer laser – is it really the bottom line? 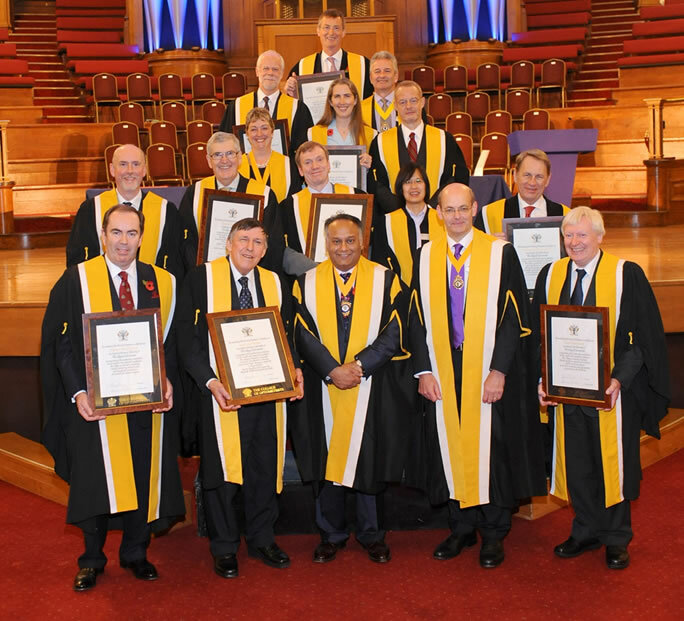 Patel S, Marshall J, Fitzke FW, Gartry D S.
Guy T Smith, Andrew GA Coombes, Richard M Sheard, David S Gartry. Unexpected posterior capsule rupture with unfolding silicone plate-haptic lenses. Kinematic analysis of surgical dexterity in intraocular surgery. Transpositional Autokeratoplasty in a Patient with Unilateral Choroidal Melanoma and Contralateral Exposure Keratopathy. Efficacy of anterior capsulotomy creation in femtosecond laser-assisted cataract surgery. J Cataract Refract Surg. 2014 Dec;40(12):2031-4. doi: 10.1016/j.jcrs.2014.07.027. Epub 2014 Oct 8. ©2019 The Wimpole Eye Clinic. Trading as David Gartry Eye Surgery Limited. 46 Wimpole Street, London, W1G 8SD.